Nobody likes to backup, but the reality is that hard drive failure or other types of disaster (natural or not) is something that we need to be prepared for at any time. What better way of being prepared for disaster than having an up-to-date backup of your data? A good backup plan will not only ensure that you have your data in a safe place when disaster strikes, but it will reduce the time you spend restoring that data to a minimum. It should also allow you to easily restore only certain files from your backup without the need to restore the entire backup for non-disaster recovery scenarios, such as when accidentally deleting files that you actually need. The first step in creating a backup plan is identifying what data needs to be backed up and establishing how important that data is. For example files that you want to keep forever, such as family photos or business plans are topmost priority. Your documents or application data such as emails, files that you use every day in your work are also important. Most likely, in this category you will have pretty small amounts of data, which could be backed up every day. On the other hand, there are music or video files that are easy to get back if lost, or other applications that don’t create or maintain data files and can be easily reinstalled and ready for use. Usually it is this type of data that takes up the most space on your hard drive and can be backed up less frequently. After you have established the priorities in terms of “what needs to be backed up”, you will need to choose “where to backup”. There is a great variety of media to choose from so we won’t go into details with this one, but you need to keep in mind that important data needs to be backed up on reliable media and data that needs to be restored quickly should be backed up on media that provides high data transfer speeds. So how do we ensure that GFI Backup will keep our backups up-to-date while taking up the least amount of space possible, but at the same time will make restoration a fast process? Along with the different types of backups that can be created with GFI Backup, such as incremental backups or stack backups that keep multiple versions of your files, the scheduling engine is very important as it ensures that regular backups of your data will be made automatically without your intervention. For instance, a simple backup strategy for your important files could start with incremental backups that run once a day. To keep things simple and fast, this Task would create non-compressed backups of your files. A backup Task with the Replace and Incremental options which runs from Monday to Friday after working hours would ensure that at the end of the week’s working days you would have all the changed files in a single destination location, such as another hard drive or LAN share. The main advantages of this approach is that after the first full backup is taken, subsequent backups are incremental, which means that only the new or modified files will be transferred, thus the backup operation takes less time. The other advantage is that changed files are overwritten in the destination, thus the backup takes less space. You need to keep in mind that as this type of backup doesn’t maintain versions of your files, if you changed one file on Monday and then on Tuesday you changed the same file, you won’t be able to restore the file back to as it was on Monday. But maybe you don’t actually need this level of versioning and one file version per week is enough for you. In this case you could expand the backup strategy by creating another Task with GFI Backup. This Task would be created with the Stack option, set to keep 4 or more versions of your files. This Task could be scheduled to run every Friday, after the previous Task. Since you already have files backed up by the previous Task to another hard drive or LAN share, you could configure the new Task to create backups from that location to an FTP location, for offsite storage. You could also use tape drives instead of an FTP server, but ideally those tape drives should be moved to an offsite location. Now let’s see what we have achieved with a simple backup plan like this. First, at the end of the week you have your important files backed up to another hard drive or LAN location. This is useful because it allows you to restore the files quickly in case of accidental loss, but the downside is that the backups are onsite and should a disaster like fire or flood occur, your backups could also be destroyed. However, since another backup Task that runs every Friday is creating copies of the already backed up files to an offsite location, you should be much more secure. Besides, the second Task is also keeping 4 versions of the files, so you will always have a month’s work available for restore. 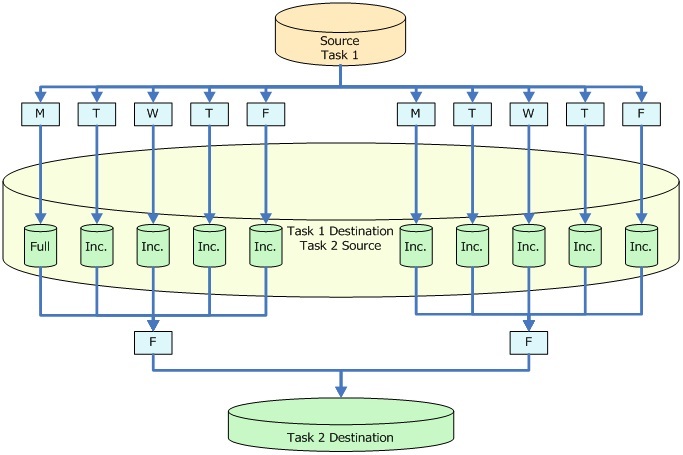 The diagram below demonstrates how the two Tasks described above created with GFI Backup will create backups over a two week period. 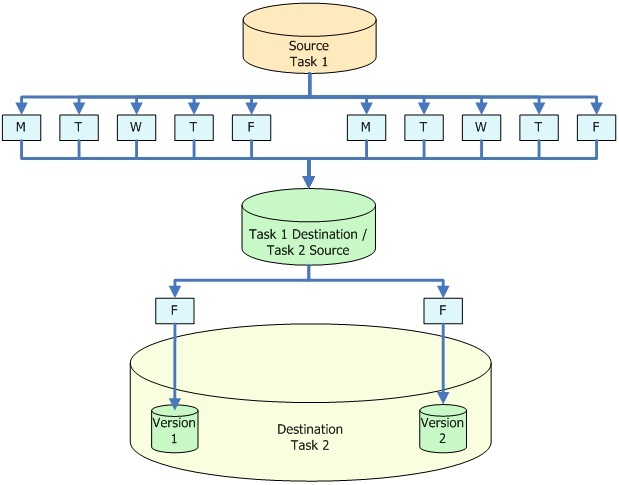 As stated above, the second Task will keep four versions of your files, but since it will work in the exact same way every week, it is enough if we display only the first two weeks in our diagram. Although at the moment GFI Backup does not create incremental backups while at the same time keeping versions of your files in the Task’s destination, there is a little “hack” that you could use. The first Task, that creates incremental backups, could be set to create ZIP compressed backup archives. In this case, older files are not actually replaced in the destination, but new archives containing only the new or changed files are created each time the Task is run. The downside is that although you have chosen to compress your files, it is not certain that you will actually save space in your Task’s destination. This depends on the number of files that are added or changed every day in the source and on their sizes. We have implemented ZIP compressed incremental backups like this because if we were to add/replace new/changed archives in the original full archive, the incremental backup would have taken much more time – basically the original full archive would have been updated every time a new or modified needed to be added to it and that can take lots of time. And let’s not forget that this is one of the main advantages of incremental backups – that they take little time to complete. Please note that when restoring with GFI Backup from such a backup, only the newest versions of your files are restored. But now the “hacking” comes into play: if you really need to restore an older version of one of your files, you can manually check in which of the incremental archives that file is contained and manually restore it. Although this may be tedious work, it’s good to know that there exists a method of doing what you need to do to restore your data. This is why GFI Backup is great when creating compressed archives: it uses a non-proprietary archive format – ZIP64 – which means that you can restore files from your backups without having to install GFI Backup. You can use any tool that is capable of opening ZIP64 archives to access and extract your files. Now that Task 1 has been dealt with and we will have different versions of our files in its destination, maybe it’s not necessary for the second task to keep different versions in its remote destination. So let’s optimize the speed and disk space requirements in the destination of Task 2: instead of the Stack option, we can use the Replace with Incremental options. Basically, at the end of the first week, Task 2 will transfer the full backup archive and four incremental archives created by Task 1 to the remote location. 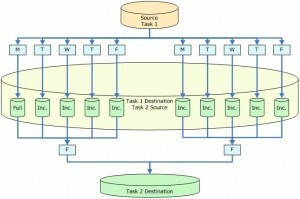 At the end of the second week, Task 2 will transfer only the incremental archives created by Task 1 in that week. This is because the archives created in the first week are already transferred to the remote location and since Task 2 is created with the Incremental option, it will detect that there are no changes made to those archives in the LAN destination of Task 1. As a result, there is no need to transfer those archives again, thus saving time and disk space in the remote location. We have presented here only two possible backup scenarios using GFI Backup, but as you can guess, there are numerous possibilities of combining different Task settings in order to achieve your goals. All you need to do is be sure of what you need to obtain and be aware of the advantages and disadvantages of each backup option that GFI Backup offers. Excellent article! Backing up is so important yet many people fail to it and learn a hard lesson when something happens. I company I used to work for for some reason never bothered to back up their data. Then one day their servers crashed and died, taking all their customer data with them! It was a nightmare! “…company I used to work for for some reason never bothered to back up their data. Then one day their servers crashed and died, taking all their customer data with them! It was a nightmare!” –> Boy, I wouldn’t ever want to be in their shoes. It may be a hassle, but backing up is an absolute necessity. It’s like wearing seat belts. Better safe than sorry. We’ve actually gone so far as to hire a third party to be responsible for backing up all our data. Unfortunately, I come from one of the company’s who have made the sad mistake of waiting too long to back up our server files. Nowadays, we spend a hefty amount of money backing up all our information. Better spend that coin now than spend a lot more trying to rebuild your database.